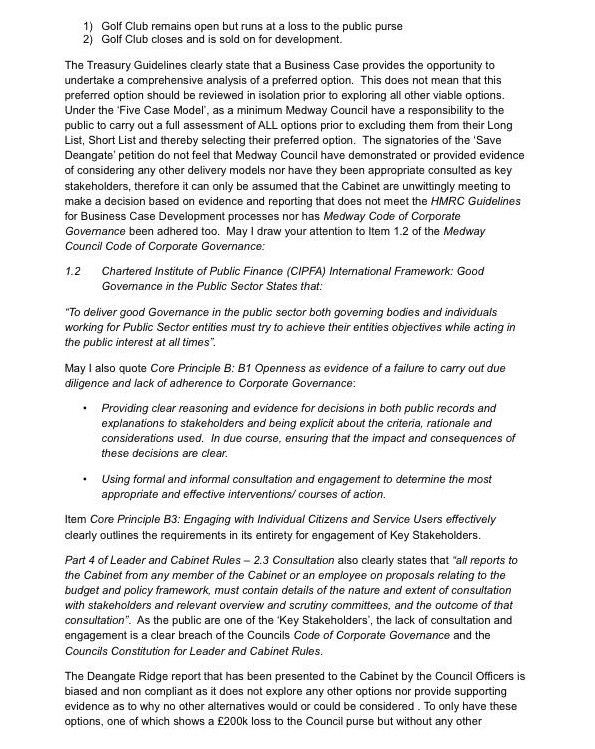 Today a letter has been sent to the Cabinet Members and Ward Councillors requesting a postponement due to various breaches of Corporate Governance. This entry was posted in Blog and tagged Deangate Ridge Golf Course. Bookmark the permalink. 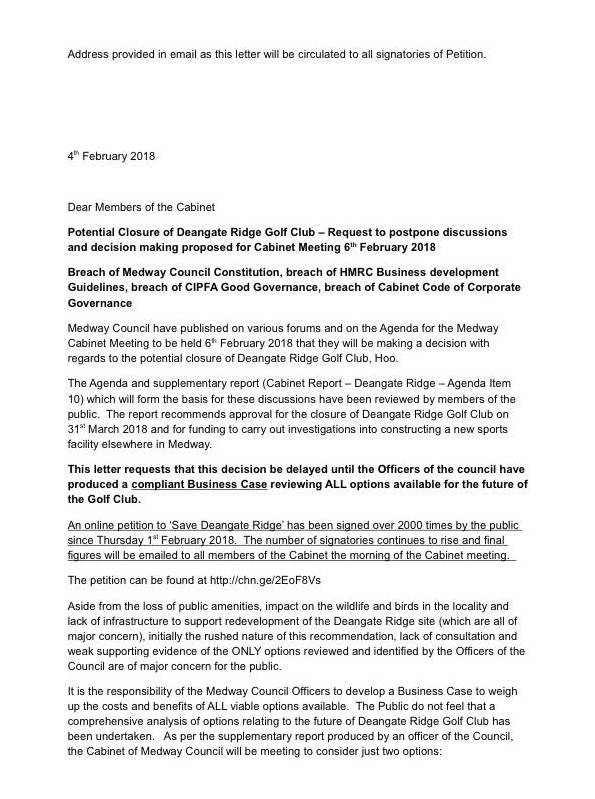 It is with great anger that the people of the Hoo Peninsula have learnt of the proposed closure of Deangate Ridge Golf Course on 31 March 2018, to be decided by Medway Council’s Cabinet on 6 February (Gun Wharf, 5.00pm). We have also seen the proposal by your Assets Department on your website that it be sold to make way for 1,600 houses. You are due to consult the people of Medway on your new draft Local Plan from 16 March-11 May this year, details of which are not yet published nor, we understand, available to councillors. It therefore seems wholly inappropriate that the fate of such a major, public-owned resource should be determined immediately prior to this defining consultation for Medway. 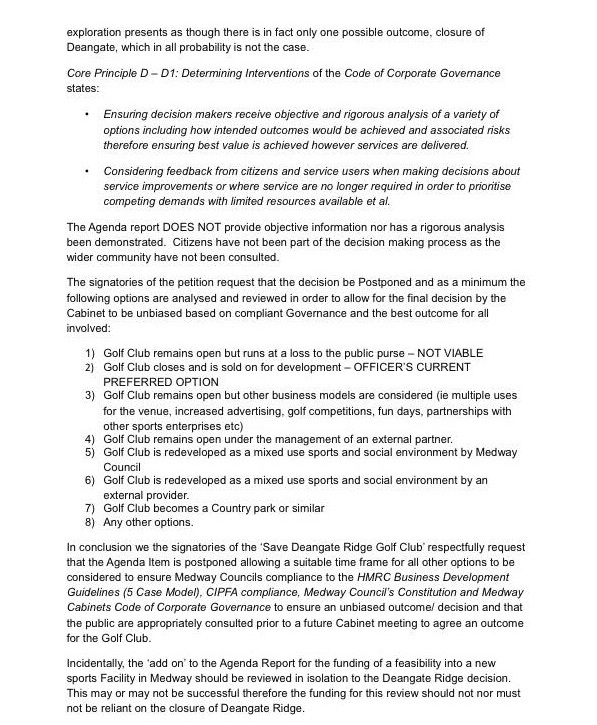 We are left to presume that development of the golf course does indeed figure strongly in your housing plans, and that seeking to close it prior to the public consultation is no accident of timing but a way of sealing its fate prior to us having our say. We are therefore urging all members of Cabinet, as a matter of democracy, to delay any decision about the golf course and to allow it to remain open until the public has had a chance to see and comment on the draft Local Plan. 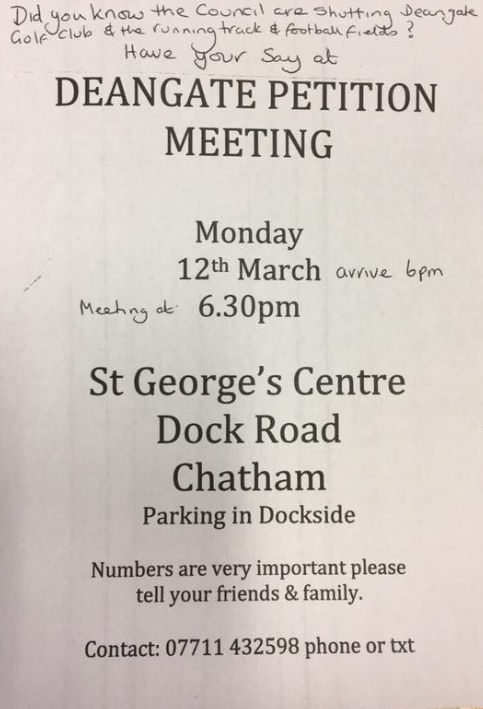 Surely we, the people of Medway, deserve to have the chance to offer our views on how a valuable asset that we effectively own might feature in our future?